Stone crusher and rock crusher in China. SBM is the most advanced stone crusher manufacturer in China, even in the world. The stone grinder designed by our expert is of high technology, easy to operate, environmentally friendly, and also low cost. The stone crushing production line produced by SBM can provide you with all-around technical supports. The whole line consists of vibrating feeder, jaw crusher, impact crusher, vibrating screen and belt conveyor. According to specific requirements, we can combine different models together to meet various needs. Our production design of the crushing and screening equipment in a joint design process, with crushing machine at all levels matching reasonable, as well as rigorous crossover of the space, so it has an small floor space, and the investment with high economic efficiency, the finished products with good shape, and low in quarry dust, the whole process smooth out the material with reliable, easy to operate and energy saving. The big stones out from hopper are transported evenly into jaw crusher by vibrating feeder for coarse crushing. After coarse crushing, the stone materials are sent to impact crusher for further crushing. After fine crushing, the stone materials are transported by belt conveyor to vibrating screen and are screened out of several different specifications of stone. The stones meeting the size requirements are sent to material pile by belt conveyor while those stones which don’t meet the size requirements are sent back to impact crusher for re-crushing which forms a closed and many times loop. The granularity of end products can be combined and classificated in accordance with customers’ needs. To protect environments, we can provide the dedusting equipment for you. The stone crusher(also called rock crusher) production line is of high degree of automation. The whole rock crusher production line almost doesn’t need any manual operation apart from the usual starting, stopping and maintenance. With high efficiency, low operation cost, large output, high-yielding, the finished stones with uniform particle size and good grain shape , our stone crusher machine is in line with national high-speed material requirements. 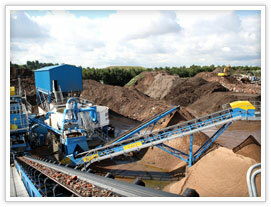 If you want to know more about our rock crusher machine, just contact us. We will provide you with the best solutions of stone production line.